Big companies and start-ups join forces to provide you with more than 30 APIs and more than 50 mentors… It is now your turn to get involved and create the most innovative application! Hackers, designers, entrepreneurs or tech lovers? 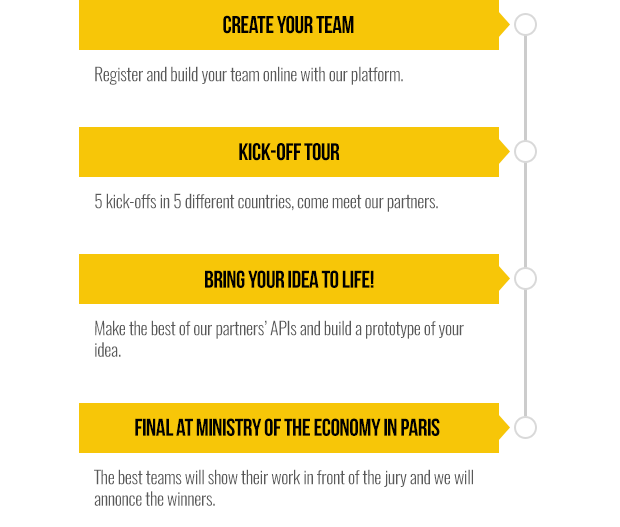 Alone or in team, register, challenge other teams and represent your country at the final award ceremony in Paris! The best teams will have the great opportunity to be mentored by the best Tech companies such as Uber, Dailymotion or even PayPal. Finalists will be rewarded with prizes worth a total value of up to €50,000, including trips to San Francisco, iPhones 6, Apple watches, and even more prizes. Your goal is to mix APIs and develop the next innovative application: Create your own team or join an existing team and chose your teammates in the « TEAMS » tab. Check out our APIs list in the « APIS & TOOLS » tab. Choose at least one of them and start developing the most innovative application. Hack4Europe has 6 categories. 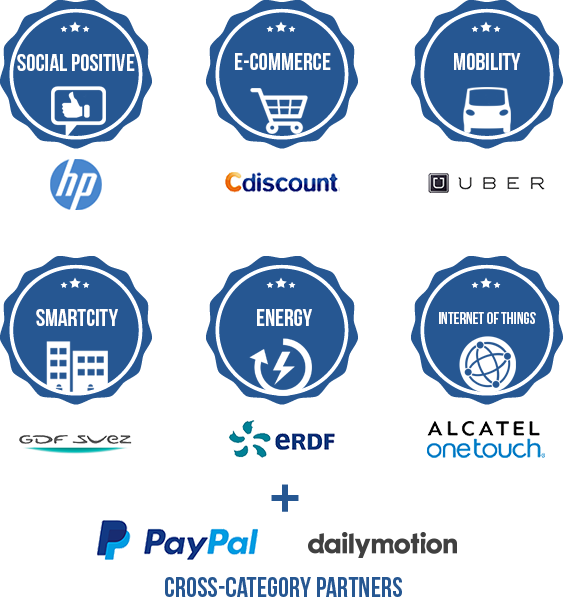 Each category is composed of an ambassador company and innovative startups, providing you several APIs. As soon as your project uses an API of at least one category, it becomes eligible for this category and therefore eligible at the special prize category. Some APIs are cross- categories and also make the project eligible for new special prize. Your project may be eligible depending on your choice to one or more categories. 1€50,000 of prizes are waiting for you!